PayPal may still be suffering slightly from a negative public perception of their operations, but it seems they are working hard on resolving that. The recent acquisition of Braintree shows that the company is extremely keen to make a serious impact in the ever-expanding world of mobile payments, but PayPal’s current mobile developer program is attracting a fair bit of attention without the help of the Braintree customer base. Silicon Valley based transportation network company Uber has made some serious changes around their financial structure to offer PayPal as an in-app payment option to users travelling with the company. This latest injection of cash into Uber has allowed the company to put a lot more focus and attention on growing their customer base and think about the bigger picture of making international payments and transactions a whole lot easier. 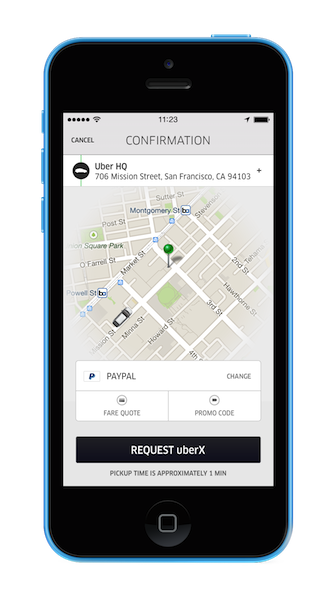 By integrating the new PayPal SDK into their native mobile apps, Uber is effectively providing customers with an easy, widely used and trusted payment mechanism that should make the check-out procedure a lot quicker. Consumers travelling with Uber will be able to quickly and efficiently register an existing PayPal account as a payment option within the Uber app. This method of adding an account is extremely similar to adding a credit card to the app, but would instead pull funds directly from the nominated PayPal balance or associated payment option. The new system will offer a seamless experience to the end-user by leveraging the power of PayPal’s new SDK. The whole linking of the account and payment process is handled within the app with no requirement to be diverted to PayPal’s website for verification. Although there is great benefit to users in having PayPal as a payment option, but Uber is thinking about the bigger picture. Their current system only allows travellers with a credit card to make a payment, which limits their intake from customers outside of the United States. Integrating PayPal as a check-out solution is one of the simplest ways of allowing customers from all over the world to eventually pay for Uber’s services when the time arrives. The current tie-in with PayPal could have something to do with Uber’s previous reliance on Braintree for payment processing, but regardless of the reasons behind the decision it’s great to see a move that will directly benefit consumers.